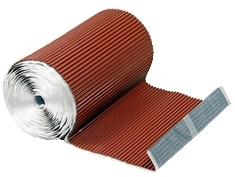 DESCRIPTION: VersaFlash HP is a high-profile single-corrugated aluminum with a color coating. The reverse side is FULLY coated with a peel/stick butyl adhesive. 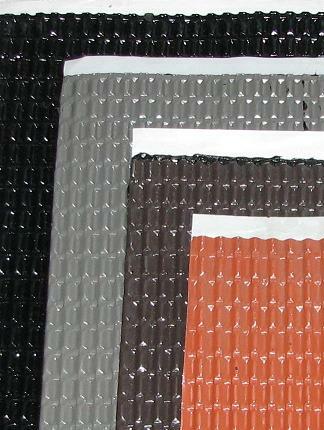 Product is a flexible roof flashing and can be used to flash hip and ridge situations, headwalls and sidewalls. Commonly used to waterproof two dissimilar surfaces. Can conform to roof to wall intersections, ridges, valleys, corrugated roof to wall, mission tile to wall, etc. Width: 9-1/2, 11, 13, 15-3/4, 17-3/4 inches. VersaFlash ST, 2-direction double corrugation/ribsfor complex angles, outside corners, chimneys, etc.